This review essay discusses a selection of key musical artefacts (works) of the early colonial era in Australia - a brief history in 9 (or so) musical objects, composed, devised, improvised, or merely imagined works, identified as Australian, in a variety of ways, by ownership or location. Treated roughly sequentially, there are complete and partial survivals and records of lost works; some Indigenous, some settler; some gentry, some working class, musicians' music and some non-musicians' music, most by men, but finally - when the documentary record admits them - quite a few by women. Not the entire story, they are useful paradigms for parsing later materials in the process of inventing Australian music from 1770 to roughly the mid 1840s. They invite us to re-engage with "the muddy issues of Australianness", and suggest that acts of cultural naming, claiming, and owning are not necessarily so superficial, problematic, or inappropriate as they are sometimes taken to be. 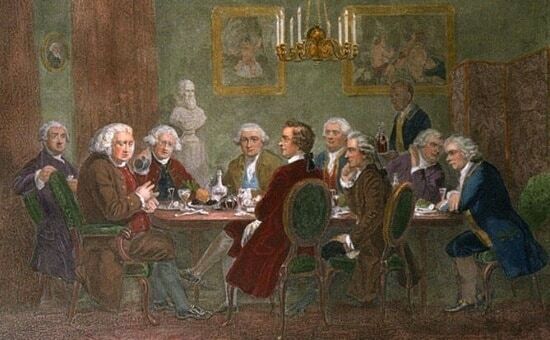 Samuel Johnson on the left talking to Edmund Burke, with James Boswell, Joshua Reynolds, with ear trumpet, Garrick, Pasquale Paoli and Charles Burney, sitting and listening; Warton sitting at the end of the table to right, whispering something to Goldsmith; Reynolds's servant and heir, Francis Barber, standing at back. The feeble beginnings of whatever afterwards becomes great, are interesting to mankind. To artists, therefore, and to real lovers of art, nothing relative to the object of their pleasure or employment is indifferent. ... In former times, when music was less understood as a science, than it is at this day, the rules, or rather the licences for accompaniment were very limited, and confined the harmony to such a paucity of permutations, as would, among modern theorists, be considered bald and puerile. We should not tolerate such music; for the habits acquired, by frequently hearing compositions in which every possible change has been introduced, would render the inexpressive, tame, and monotonous accompaniments of those musicians, who were contemporaries with the celebrated Guido, (to whom the art is highly indebted), little more gratifying than a peal on an octave of hells. We are not, however, to suppose, that plain, simple, melodies are beneath the composer's notice, far otherwise, we could quote many little strains, in which every note is attractive, and which, when duly accompanied, give the greatest delight. Perhaps Pleyel's German Hymn may, in that respect, be considered as neat a specimen as could be quoted; in it we have all the suavity of religion, without any of the dull, tedious, or tautological circumstances which characterize a large portion of church music. The variations annexed to that pleasing air, are proofs of the composer's taste; while the presto which follows, and is upon the same subject as the hymn, given a most agreeable, termination, and is so managed as completely to change the character of the music. The art of composition requires great genius, taste, judgment, a fine ear, and the utmost patience! without these, good music will never be produced. We should, at the same moment, studiously avoid that pedantic bias, too often received by men of the first abilities, whereby a certain stiffness, and deficiency of air, are sure to follow; few, indeed, have the happy gift of acquiring all the necessary attainments in the theory, and to preserve a pure taste for those lyric compositions which are so highly relished by the multitude. We have, however, seen a Rosina start from the brain of science! Yet, after all, it is frequently with some, difficulty that the favourite airs of other nations gain admittance among us. With persons who can appreciate merit, and who can discover beauty, even among features which may not be very regular, foreign compositions are well received; but it appears to us, that the English (speaking of the multitude) have nearly as much partiality for a peculiar stile, such as the ballads of Dibdin, as the Scots have for their reels, strathspeys, &c. In fact, almost all music may be considered as national; for in every country we find either a peculiar measure, a peculiar mode of accenting, a peculiar kind of expression, or some one or more peculiar circumstances, which at once give a designation to the composition. The Irish nine-eighths; the Scots reversed punctuation; the accent of the Polacca on a part of the bar we seldom, or never accent; the great simplicity of the English ballad; the naivette of the French pastorale; the wild, yet impressive Hindostanee air; the graceful Italian canzonette; the trifling, but cheerful, air Russe; and a variety of others, establish a certain index of national character, at least as conspicuous, and as prevalent, as the features of their various inhabitants. Smollet in his History of the Hebrides, tells us, that every laird entertains a piper as one of his household, who always marches at the head of the clan, with his bagpipe, to animate them to battle, with martial tunes composed for that purpose; and that such is the influence of this single instrument over these people, that the piper, by varying his airs, never fails to melt them into sorrow or despondence, and by a sudden transition of rousing them to rage and revenge, and a total contempt of danger and of death; nay even in the greatest emergency of war they will not march a furlong or draw a sword, without being roused by the music of this instrument. The highlanders have a particular species of tune, called a pibroch; some of their tunes (which a stranger cannot possibly reconcile to his ear) are intended to represent a battle; they begin with a grave movement resembling a march, then gradually quicken into the onset, run off with a noisy confusion and turbulent rapidity, to imitate the conflict and pursuit; after which they swell into a few flourishes of triumphant joy; and close with the wild and slow wailings of a funeral procession. This transports and elevates a highlander; it conveys to his mind the sublime ideas of danger, courage, armies, and military service. There is a dance in Swisserland, which the young shepherds perform to a tune, played on a sort of bagpipe, called the ranz des vaches; it is wild, and has little to recommend it, if we judge only by the notes, without being acquainted with the style and manner of it. But the Swiss are so intoxicated with this tune, that, when abroad in foreign service, if they hear it, they burst into tears, and often fall sick, and even die of a passionate desire to visit their native country; for which reason, in some armies where they serve, the playing of it is prohibited. This tune, the attendant of their early youth, recalls to their memory those days of liberty and peace, those nights of festivity, those tender passions, which formerly endeared them to their country; and awakens in them such regret, when they compare their former happiness with the scenes of tumult they are engaged in, and the servitude they are obliged to undergo, as entirely overpowers them. Mr. Bruce, in his description of the war-trumpet used in Abyssinia, says that it sounds only one note, in a loud, hoarse, and terrible, tone; that it is played slow, when on a march, or before an enemy appears in sight; but afterwards it is repeated very quick, and with great violence; and has the effect upon the Abyssinian soldiers of transporting them absolutely to fury and madness, and of making them so regardless of life, as to throw themselves into the midst of the enemy, which they do with great gallantry. He adds, that he has often, in time of peace, tried what effect this change would have upon them; and found that none who heard it could continue seated, but that all rose up, and continued the whole time in motion. Music is in a great measure under the continual influence of memory; that is to say, our pleasure arises not merely from quietly listening to the notes, but from our associating the sounds of those notes with events that have happened long before. This may probably be the reason why a new piece of music, however we may afterwards do justice to its beauty, will seldom make so strong an impression upon us as an old one; and why, in every country, the favourite and real national music will for ever be observed to have a different style from what it is found to have in another country. Music, thus being an accompaniment to our feelings and actions, will therefore display sounds analogous to them, and consequently we shall prefer not only the national tune, but even that tune if sung in our own perhaps ruder language, to the sweetest foreign one. However finer the last may be than our own, however more melodious the sounds may really be than those of the songs of our ancestors, or of our own living national composers, we shall, perhaps, in listening to their finer melody, luxuriously spend our hour, but feel nothing of that warmth with which we are inspired at hearing one of our own national airs sung or played, particularly when unexpected. And thus that national music, viz. those sounds which express the character of a nation, will never be entirely fettered by general rules of beauty. The voluptuousness of Italian national music will paint a life chiefly spent in pleasure and enjoyment under the most beautiful sky in the world. Next to it comes the national music of the Portuguese, more like the Italian than any other, exhibiting a nation, where, in the want of genius for invention, an astonishing talent for imitation, and a taste in the choice of what they hear and see, has become in itself a kind of interesting originality. Spanish songs bear a resemblance to both; but they possess more energy, united to a romantic turn, and to a certain pompousness. The national music of all northern nations has in general a melancholy cast, appropriate to a cold climate, connected with a solitary life; yet there will be found some striking differences by which the several nations are characterised. The national songs of the Russians will be easily distinguished both from the Irish or Scottish, or from the Danish or Swedish. There is in their melody very often a sort of barbarism, as the song generally does not finish in the key-note, a peculiarity which is much less observed in the tunes of the other northern nations. To hear a regiment of Cossacks sing, on entering a town, is like listening to the elaborate chorusses on the stage. Whoever knows how difficult it is, sometimes, to make a chorus go on well, even when executed by those whose profession it is, must be struck when he hears common soldiers perform with the greatest accuracy. Whether this talent for music is inherent in the Cossacks, or whether it has been the fruit of study propagated through many centuries, remains doubtful. With this latter supposition we might perhaps look upon it as being derived from the Grecian canonic song in the churches, in the times of the Christian emperors, when, unlike our choral songs, in which every body uniformly sings only the melody, the fingers executed the different parts according to what they thought agreed with their voice; a custom which in still kept up in the Grecian liturgy. The imperial horn music, where from fifty to sixty people play upon the horn, and where each of them, having but one note to sound, yet falls in always exactly at the given time, and so contributes to the performance of a most beautiful concert, is another instance of musical talent which no other country affords. The great softness of the Swedish, and particularly the Danish, language, makes the songs of those two nations appear less striking than would be the case if we could hear the music set to words of perhaps ruder language. A language may be soft without being agreeable, and may sometimes want the force of the neighbouring idiom without possessing the luxuriant and voluptuous harmony of words of that of another more southern nation. Very characteristic, and seemingly like each other, yet different, are Scottish and Irish songs: though both are melancholy and gloomy, and though both of them paint the discomforts of solitude, and of a northern climate, yet there is in the Irish tunes more variety than in the Scottish. England may perhaps be said not to possess any national music at all. There are, no doubt, songs; yet it would be very difficult to recognise by them the character of the nation. To find out the cause of this singular phenomenon, in such a celebrated and great nation, will prove an interesting enquiry. Baron Arnim reasons upon it as follows: If by national music we are to understand the expression of national character, the word character can naturally not be understood otherwise than the representation of the reigning propensities of such a nation in conjunction with the climate in which it lives, and with  its moral and political situation, which have operated either in suppressing or in encouraging these propensities. But we believe it would be difficult to point out any other propensities of the generality of the English nation than the love of virtue, country, and domestic happiness, every effusion of enthusiasm being already suppressed as well by religion and education as by habit. These propensities of the mind, united to a mild climate and to a happy and glorious constitution, will therefore make the songs of the English appear gay, although not very lively; and therefore pleasing, without producing a deep and lasting impression. But, allowing the English to have strong passions, there exists another reason which explains the absence of national music in them; that is, they have no leisure to exhale their character in songs. The national song has always been the offspring either of solitude, and of activity (if mind and feelings, without the means of applying it to action, or of a voluptuous doing nothing - the dolce far niente of the southern nations, the effect of a hot climate, which, joined to an ardent imagination, invite us either to the enjoyment of repose, or to the gratification of the senses. The difference between the stanzas of a song and the verses of many an epic or didactic poem is therefore almost the same as that between a national melody and a great musical composition, in which harmony is often found superior to melody. A genuine national song is, as well in words as in melody, the produce of imagination. A poet, who in such a moment is conscious of the rules of poetry, a musical composer who remembers those of music, will never produce any thing that may please the whole nation, whatever be the occupation in which individuals are engaged. The most national song that ever has been generally sung throughout a country is the German air, Freut euch des lebens, "Life let us cherish." The composer (his name is Nageli) is only known as the author of some learned music, which perhaps will one day be forgotten; but his song will last for ever, as well as our famous air of "God save the king." 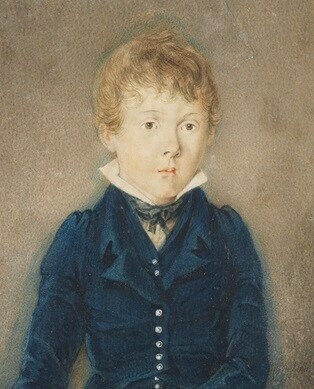 In the southern climates, the youth sits in the evening before his door; the heat of the day is over, the air is tranquil, no idea of rain or storm, the sun is setting with a glow, the sky produces a finer blue than anywhere else; he is perhaps awaiting the fair one who will bless him with love, or is retracing past happiness. What reason for inspiration of rapturous ideas! Words and music come almost together. Who can think of a rule, or count the syllables on his fingers? and yet the song is enchanting. If the northern nations do not see their sun so glowing, if their sky has not the same blue, and if the plants do not exhale the same fragrance in their country, yet not less does the want of all this inspire the poet and the composer, and produce familiar effects, although the style of the compositions will be found very different. It is therefore not always what nations enjoy, but very often a consciousness of the privation, which produces their songs; and it is this which accounts for the melancholy and gloomy cast of most of them. The most fertile inspirer of songs is Solitude. Among all mountainous countries there will of course be found specimens of national music; and, from the times of old until ours, the shepherds have not only invented songs, but their occupations have even supplied the theme of many a musical composition. It is for these reasons that any free and at the same time commercial nation, where, every-body, during the day, is either involved in the bustle of his own or of the affairs of the community, and where, in the evening, the great interests of the state absorb people's minds, and are discussed, will not have many national songs; and this is particularly the case with the English, where, by the care of the welfare of the community, and the constant endeavours to keep up a free and glorious constitution, man is almost constantly attracted, from his earliest youth till the last days of his existence in this world. Previous to the Commission of my Successor [Thomas Brisbane] being read, I wish to address a few words to you by way of taking leave ... The length of time I have governed this Colony, the progress it has made in improvement during my Administration, and more especially the fond recollection of my only surviving Child being born in it - all combine in attaching me most strongly to it. I shall not fail to cherish the same sentiments of attachment in my Son [Lachlan Macquarie junior] - who, although yet so young, feels, and already expresses, the strongest affection for his Native Australian Land. My most fervent prayers will accordingly be offered for the welfare and prosperity of this Country, and for the happiness of its Inhabitants; fondly, and confidently anticipating, that, in less than half a century hence, it will be one of the most valuable appendages belonging lo the British Empire ... In these sentiments and wishes, deeply engraved on my heart, I now bid you all - Farewell! LACHLAN MACQUARIE. Sydney, New South Wales, Saturday, 1st Dec. 1821. Music seriously applied, is one of the noblest entertainments that can engage the mind of man, it humanizes the passions, strengthens devotion, and exalts, the soul with the sublimest ideas. 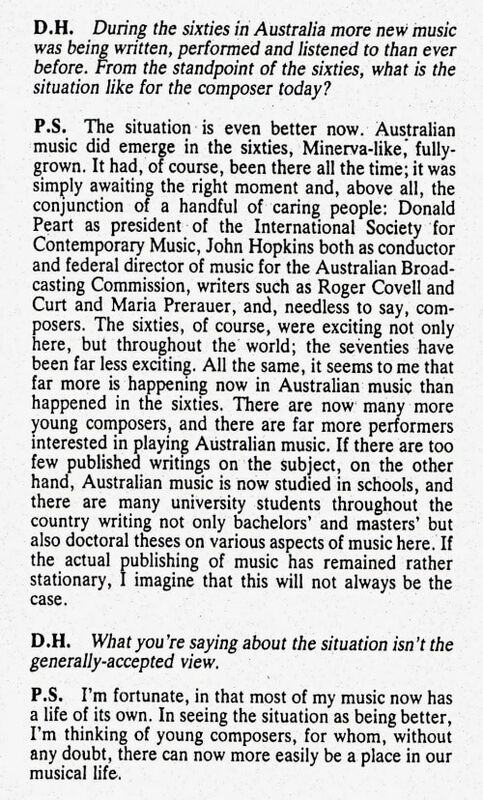 As a proof of its salutary effects, we may boldly assert, that among the whole prison population that have arrived in Australia, there never was a professor of music. We are none of those who go to Concerts, merely with a view of spending an idle hour or banishing ennui; we look upon the cultivation of the divine art, particularly in this Colony, as a great national affair, and an object worthy of the attention of the legislature, and of the public individually and collectively. The time we trust is not far distant when Australia will occupy a high place among the nations of the earth, and if the fine arts, and more particularly music, were found to advance the objects of the legislators of antiquity, while music was in a rude and infant state, how much more beneficial must its effects in modern times be, now that it has arrived at a degree of sublimity and perfection which it requires a constant contact with to believe to be human or possible? With these thoughts in our mind, we proceeded to the Victoria Theatre, on Wednesday evening, which we were pleased to see so neatly fitted up for Mrs. Bushelle's concert. His Excellency the Governor (who is becoming we think, deservedly popular) was present, with Lady Gipps, and nearly all the beauty and fashion of Sydney. The concert was, we should think, one of the best that has ever been given in Sydney. Monsieur Gautrot's solo on the violin was delightful, and and though not much in the modern style, was executed with a degree of good taste which is exceedingly rare. We have very seldom heard such correct intonation elicited from that difficult instrument, with the same degree of purity. If any of our readers think us too partial to Gautrot père, they will probably be more surprised when we state that we do most distinctly raise our voice against Madame Gautrot's most ludicrous and unmusical style of singing. It is nothing, absolutely, but music-run-mad. She sings neither in time nor in tune, both of which she could do admirably, if she would attend to the composer's notes and marks, and to them only. Does not Madame Gautrot know that Rossini, unlike other composers, inserted in all his compositions all and every one of the embellishments which he wished to be used in them, and that he pointedly condemned all attempts that were made to add additional fiorituri to his melodies. God knows! in all conscience he had reason, for they are already numerous enough and to spare. Madame Gautrot, with wonderful command of the musical powers which Nature has given her, might sustain the character of an excellent artiste, by devoting herself to the cultivation of pure melody, but for a person whose voice is unusually unmanageable, to attempt to sing à la Catalani, is, to say the least, not judicious. We trust that these and the following remarks will not be misunderstood. - We were much pleased with Mrs. Bushelle's singing generally, it was a decided improvement on her performance at Dr. Reid's concert; but we could not comprehend a note of her "Black-eyed Susan," which she sung in common time instead of 3/4, in which we had always heard it. Mrs. Bushelle's Italian songs were well sung, but we have still to complain of these spurious embellishments. - Depend upon it the composer is the best judge in these matters; and although the public may call for these absurd ornaments and applaud them, music suffers, and so must, ultimately, the musician. It is for excellent performers like Mrs. Bushelle to lead public taste, not to follow it. Mr. Bushelle was, as usual, admirable. We doubt if Lablache himself, could sing "Miei rampolli femminini" better. Mr. Bushelle is a decided favourite, and ought to be so; he has great command of a powerful voice, and is possessed of much good taste. But we are bound to say, that this taste was completely at fault in the selection of bushranger songs, for a concert patronized publicly by the Governor of this Colony. In an opera these things are all well, but a moment's reflection will convince Mr. Bushelle that they were ill-chosen on the present occasion. Mr. Wallace's Solo on the flute was deservedly applauded, and so also, Mr. Stanley's Concerto. Above all, Madame Gautrot's "Rule Britannia" was irresistible, and we feel ourselves as yet completely shaken from the effects of it. Upon the whole, though the style of this concert is not our favourite style, we were highly gratified by the performances, and we hope soon to hear all parties again, particularly the Bushelles, et notre cher Monsieur Gautrot père.